Clemson, S.C. – The Clemson Tigers Network will feature a new lineup of broadcast talent for the pre-game Tiger Tailgate Show and the Solid Orange 5th Quarter Show for the 2018 Clemson football season. 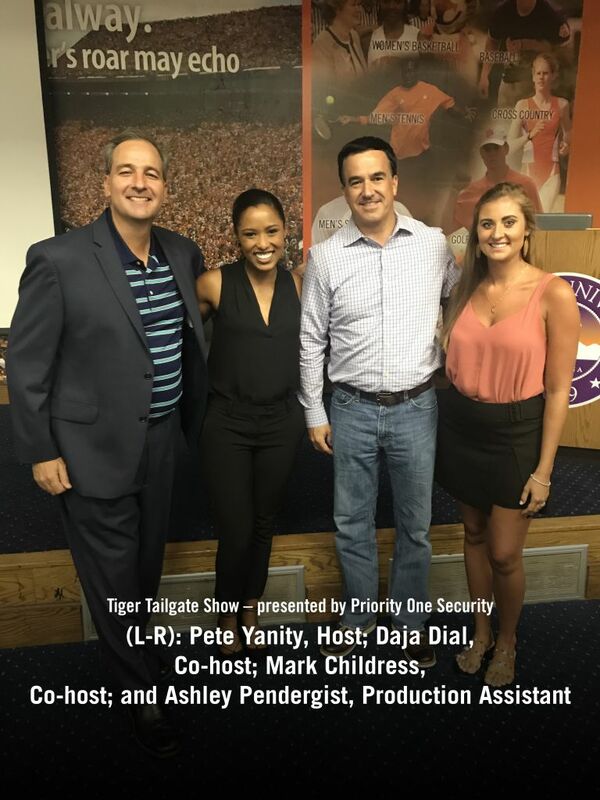 The Tiger Tailgate Show – presented by Priority One Security – will be hosted by Pete Yanity, sports director for WSPA-TV. Mark Childress and Daja Dial will serve as co-hosts for the show, which is broadcast live three hours before kickoff. Childress is a radio host on ESPN Upstate, and Dial is a former Miss South Carolina and varsity Clemson cheerleader. For home games, the Tiger Tailgate Show will be broadcast in front of a live audience from the Swann Pavilion at Littlejohn Coliseum within the Tigerville fan fest area. 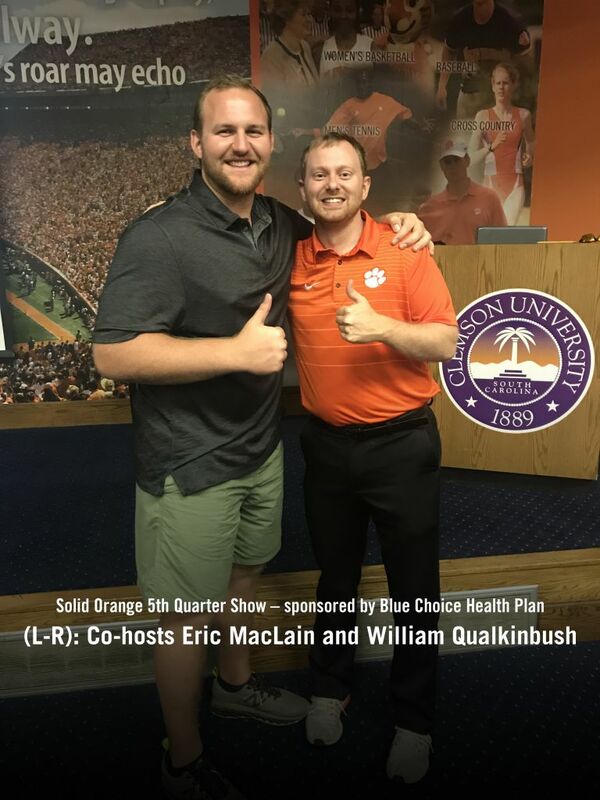 The Solid Orange 5th Quarter Show – sponsored by Blue Choice Health Plan – will feature an extended 90-minute format and include co-hosts William Qualkinbush and Eric Mac Lain. Qualkinbush is a play-by-play announcer on the Clemson Tigers Network and a show host on WCCP “The Roar.” Eric is a Clemson football alum and was captain of the 2015 team that earned a berth in the National Championship Game. For home games, the Solid Orange 5th Quarter Show will be broadcast live from the Mellow Mushroom on Tiger Boulevard in Clemson starting approximately 30 minutes after the game. The new show will feature exclusive locker room interviews with Head Coach Dabo Swinney, assistant coaches and players, as well as in-depth game analysis and scores from other key games. The game broadcast team will once again include the “Voice of the Tigers” Don Munson on play-by play, Rodney Williams as color commentary, and Reggie Merriweather on the sideline. Retired Clemson football SID Tim Bourret will make guest appearances as a color analyst for several games this season. In addition to the radio broadcasts, the Tiger Tailgate Show and home Solid Orange 5th Quarter Show will be streamed on Facebook Live (@ClemsonNetwork). For information on where the broadcasts can be heard on the radio and on mobile, or to listen to the shows and game broadcast online, visit ClemsonTigers.com/radio-affiliates. About Clemson Sports & Campus Marketing: JMI Sports is the official multimedia rights and corporate sponsorship partner of Clemson University. Operating as Clemson Sports & Campus Marketing, our team works as an extension of Clemson University and Clemson Athletics to expand partnerships with corporate sponsors and enhance multimedia platforms. The Clemson Tigers Network is the platform for live radio and audio streaming broadcasts for football, basketball and baseball games and related programming. By creating customized marketing solutions that achieve the unique and multi-faceted business objectives of each company, we seek to build valuable long-term relationships between the University and its partners, while enhancing the experience at athletic events, on campus and across all digital platforms.